John Longisa was a dirt poor ranch hand in the wild bush country of West Laikipia District, a few hours West of Mt. Kenya. Ten years ago, John fractured his leg seriously and was rushed to the Nanyuki District Hospital. While recuperating in the hospital, one of our Church members was directed by the Holy Spirit to John’s bedside. John immediately recognized that the Gospel of Jesus Christ was the answer to the gnawing spiritual need for God which he had been feeling. He accepted Christ right then on his sick bed. After recovering, he returned to his job on the ranch. 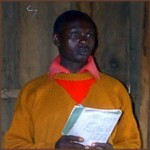 John was a baby Christian, so he begged us to come and preach to his people out in the bush. The response was good. A small congregation was established. John was a natural leader, and he was hungry for Bible teaching. But, the logistics were just too difficult! So, we felt impressed by the Lord that we should bring John and his family to Nanyuki and enroll him in our Bible Institute, with the aim of going back to his people as a missionary when he finished the course. We employed him as a driver in our School ministry. Then, we employed his wife as a cook. Suddenly, they were making a very comfortable living in Nanyuki, and their children were attending our high quality school. After John finished his Bible Institute course, he resisted the call which the Lord had originally placed upon his heart. The good income, job security, and high quality education for his children, caused him to find excuses why it was not the right time — or maybe even not God’s will at all — for him to return to his people as a missionary. But, the Lord was dealing with him, and he became increasingly uneasy and even irritable. It was an agonizing decision, but John and his dear wife, Lucy, surrendered to leave our town church and go out into the wilderness of West Laikipia District as Missionaries. John was one of our fine deacons, and we actually hated to “lose” him. But, how could we say no when he was willing to give up all the security of his city job and comfortable life in order to respond to God’s call. That kind of commitment is so rare!! 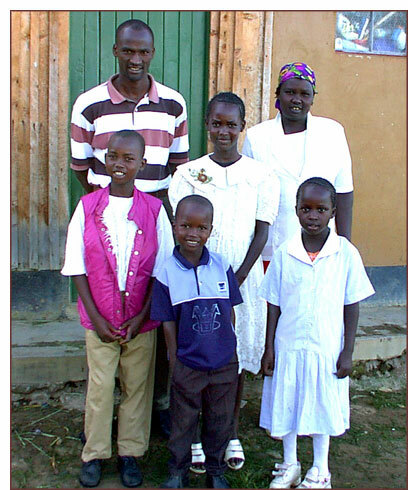 John was ordained and sent out as a missionary last month (January 2003). The Nanyuki town church members gave them a wonderful send off, giving John a new bicycle, other household items and a large cash offering. The church is supporting the Longisa family monthly, but it’s not enough to live on. They found a small two-room house to rent in Rumuruti, the main town in that large expanse of bush country. It’s like an old “wild west” town — with constant insecurity. The second week in their new home, bandits swept through the town, killing and robbing. Still, John and Lucy are radiantly happy to be in the place God where wants them to minister! They have already started Sunday services, and are looking for a larger place for the new church to have more room to grow. They need lots of prayer as they look to the Lord for their daily protection, provision of their financial needs, and fruit in this new ministry is such a difficult place! Karimba is a small settlement area on the northern slopes of Mt. Kenya. Over a year ago, Pastor Stephen Ngunjiri, and the congregation of Bible Baptist Church in Timau, had a burden for the Karimba area. 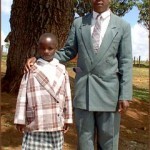 After careful planning, and counting the cost, the Bible Baptist church sent David Gathungu and his family to Karimba. The Timau congregation are committed to 100% financial support of this new church planning project. God is blessing this new ministry. Souls are being saved and baptized. All over East Africa, there is a rapidly increasing number of orphans, due to disease (AIDS being the biggest problem) as well as tribal conflicts, banditry, etc. One local church in central Kenya has decided to do something about this need! 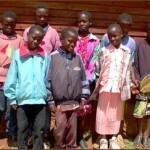 The Bible Baptist Church of Timau has gone out on a limb and committed themselves to caring for 9 orphans in their community. There are approximately 60 orphaned children in the immediate area which they would like to help, but the church’s resources are limited. Hired a part-time teacher to tutor some of the orphans who don’t have the opportunity to attend school. 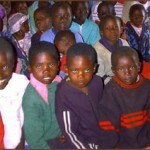 Bought uniforms and paid school fees for some orphans. 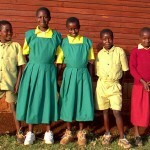 (It costs approximately $250 per year to clothe and educate one child). Set up a feeding program for orphans who otherwise would be forced to scavenge in the streets. It costs about 50 Shillings per day (65 cents) to feed one child. This doesn’t sound like much, but it is a crushing burden to the Timau Church. Help feed an orphan. For $20, you could feed an orphan for a month! 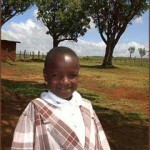 Pay School Fees and provide School Uniforms for an orphan. For $250, you could cover the entire cost for one orphan for a year! Contribute to the Orphanage Building Fund. It is the Church’s dream to build a small facility right next to the church. They have adequate land. There are Church members who are willing to minister in this Home as counselors, teachers, and helpers. What a wonderful outreach this ministry would be to the entire region, enabling the Timau Bible Baptist Church to share the Gospel with literally thousands of people who might not clearly hear the Gospel in any other way. During time of crisis, people are willing to listen to those who are showing love and concern! Click here for information on how to send contributions to this or any other projects for which you might feel burdened.